iFourWinns would like to thank Scott L. for starting iFourWinns - he has graciously passed this on to Scott M. as his interests have changed. 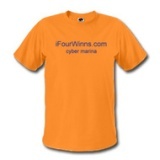 iFourWinns is a site for Four Winns boat owners and enthusiasts to gather, share, and learn with other boaters. Please feel free to join the Four Winns forum. We are looking for advertisers to help continue this site. Feel free to email for additional advertising information and pricing. This website is not affiliated, endorsed or sponsored by Four Winns boats or its parent company, Genmar Industries, Inc.
For the official Four Winns' website, please visit www.fourwinns.com.